Growth is a funny thing: as a teenager, either through misguided musical elitism or social construct, there’s no way I’d have admitted to liking anything remotely poppy. These naive prejudices tend to abate with age, thank God – a lot of the pop music being produced today defies genre, pushes boundaries, and tackles social issues with purpose. This post, I’m glad to say, isn’t about me or my changing musical taste. It’s about an album which could be the most interesting pop release of 2018. Fame and influence, the kind of which many modern superstars enjoy, has not been wasted on Ariana Grande; alongside a rake of enormous chart hits and critically-acclaimed albums, the former Nickelodeon star has consistently raised awareness of the music industry’s gender-based double standard, made myriad efforts on behalf of numerous charity groups the world over, and last year oversaw the organisation of an entire benefit concert for the victims of a terrorist attack which targeted her concert in Manchester, UK last year. It would be easy to forget, alongside all of her good deeds, that Grande remains one of the most formidable figures in modern pop music. Since debuting her powerful voice and expressive lyrical persona on first album Yours Truly in 2013, Grande has grown her musical brand into something unique, diverse, and almost universal in its appeal, blending together elements of R&B, contemporary hip-hop, soul, and classic pop. Her last album Dangerous Woman (2016) is a musically rich experience, featuring deep house influences (“Be Alright”), instantaneous pop bangers (“Into You”), and contributions from rap royalty (“Let Me Love You”, with Lil Wayne), all the while keeping Grande’s multi-octave powerhouse vocals as the star attraction. It’s this remarkable voice which is the deliberate and clear star of latest album Sweetener; from the beginning, Pharrell’s pared-back, minimal production works to expose Grande’s vocals in all their strength and versatility. Album single “the light is coming” has a bouncy, hypnotic instrumental built around sparse, synthetic percussion and loud vocal samples (reportedly from a TV news channel? ), the kind of which are usually heard in hip-hop, while Ariana flits between lush multi-part harmonies, and the song’s half-spoken titular mantra. While daring, it lacks the gloss and panache of lead single “no tears left to cry”, a multi-hook anthem-in-waiting, which illustrated Ariana’s mission to produce feel-good music in the wake of last year’s carnage. Lyrically, Sweetener offers wave after wave of intimate expression, as Ariana pours her heart out over fiancé and Saturday Night Live alum Pete Davidson; this includes references to “wedding bells” on “R.E.M“, and rhyming couplets built on infatuation: “I thought you into my life / Look at my mind” (“pete davidson”). Single “God is a woman” marks Ariana’s grandest musical statement to date, with gospel harmonies and trap-influenced beats to carry the vocal, although the lyrics never fully live up to the title, relying on familiar tropes of lust: the concept of “God is a woman” is intriguing, but this isn’t the time or place for theology. The highlight of Sweetener, predictably, is Ariana’s breathtaking vocals, and the ease with which she delivers both earworm hooks and soulful note-perfect runs. Pharrell’s daring production is another source of the Sweetener‘s charms, although the bright, glitchy aesthetic the album offers from the start doesn’t run all the way through; “everytime” is a much harder, moodier synth-pop number, echoing the club-friendly nocturnal vibe of songs like “Into You” and “Know Better/Forever Boy” from Dangerous Woman. The guest features are one element which distract from Sweetener‘s saccharine streak; Nicki Minaj’s “bad guy” shtick feels misplaced on “the light is coming“, while Missy Elliott never really beds into her 20-ish seconds on “borderline“. Perhaps down to production choices, and perhaps down to Ariana’s purposeful desire to create an album of brightness and positivity, Sweetener takes a number of artistic risks. On her fourth album, Ariana’s voice remains just as formidable as ever, while the production marks a clear departure from Dangerous Woman‘s more conventional, radio-friendly pop sound. 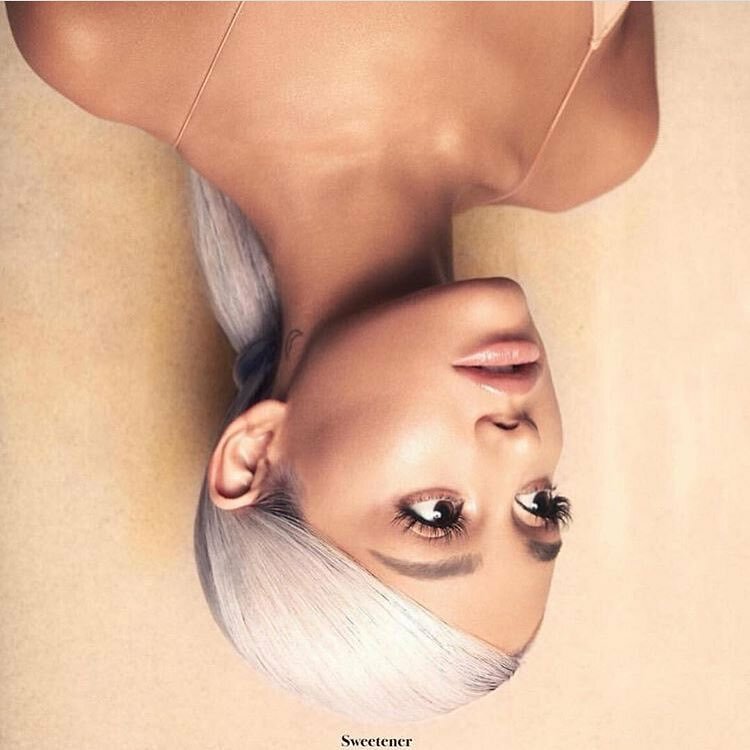 Though this yields some truly memorable moments, and a number of songs which already stand among Ariana’s most iconic, Sweetener could have profited from focusing more intently on one style of production, reducing the runtime, and maybe minimising the guest features to let Ariana’s talent stand unaccompanied. But as the carefree, loved-up expression of positivity Ariana hinted it would be, Sweetener is a mission accomplished. That’s what really drew me to her music, the songs are a matter of taste but she really has such an amazing vocal ability. Thanks for reading!